The price of sugar in fizzy water has gone up. Yesterday the government introduced a 'sugar tax' on soft drinks, affecting any beverage containing more than 50 grams of sugar per litre. The tax is 18p per litre for any drink with 5-8g of sugar per 100ml, and 24p per litre for any drink with more than 8g of sugar per 100ml. That's a hefty mark-up. The idea is to dissuade us from buying drinks that are bad for our health, but also to nudge manufacturers into selling drinks with less sugar in. Irn-Bru, Ribena and Lucozade have all reformulated their recipes to have less than the threshold, so they're not affected by the tax hike. But Coca-Cola and Pepsi market themselves very much on taste, so didn't dare tweak their 11g per 100ml, so they're being charged top whack. But what does this mean in practice? To find out I checked the prices of several well-known fizzy drinks on Thursday, before the sugar tax was introduced, and then checked them again on Friday to see what the impact had been. On Thursday my local Tesco was selling the following sizes of ordinary 'Classic' Coca Cola. If you like Coke, the best value deal was the 1.5 litre bottle (87p per litre), and the worst value was the 6 cans (£1.53 per litre). It is astonishing how much extra people will pay for exactly the same liquid in different packaging. And what happened on Friday? Let's start with the 1 litre bottle, because that's easiest. The sugar tax on Coca Cola is 24p a litre, so we need to add 24p to the price, so the new price is £1.25. Similarly the 1.5 litre bottle merits a sugar tax of 36p, so the new price is £1.66. And the 6 cans between them contain 2 litres of Coke, so that's 48p added, making a nice round price of £3.50. Hey presto. And these are indeed the new prices being charged, except for the pack of 18 cans which for some reason is on sale at £8.00 rather than the expected seven. Special offers, and unexpected mark-ups, do sometimes muddy the calculations somewhat. Oddly when I visited Tesco online on Thursday, rather than my local store, they were already charging Friday's prices. This premature surcharge seemed somewhat unfair. Meanwhile Sainsbury's and Asda didn't increase prices on their website until today, one day late, which is good news if you went shopping yesterday. So I'll now focus on Waitrose, who charged different prices online on Thursday and Friday, to illustrate the impact of the sugar tax. Here are the overnight price rises for various quantities of standard Coca Cola at Waitrose, compared to what the sugar tax suggests they ought to have been. Unlike Tesco, Waitrose have passed onto the consumer all the extra VAT the sugar tax incurs. With VAT included, the top rate of increase is 29%, not 24%, making this an even tougher discentive than it initially appears. Other, non-sugar-heavy drinks are of course available, and their prices haven't risen. For example a 1.75 litre bottle of Diet Coke still costs £1.69 at Waitrose, and 8 cans of Diet Coke still cost £3.59. If you're in a shop and want to see the implementation of the sugar tax writ large, compare the prices of the diet and non-diet versions of your favourite fizzy drink. Once you've seen that the difference is as much as 50p on a 2 litre bottle, you'd be a fool to buy the expensive sugary version. 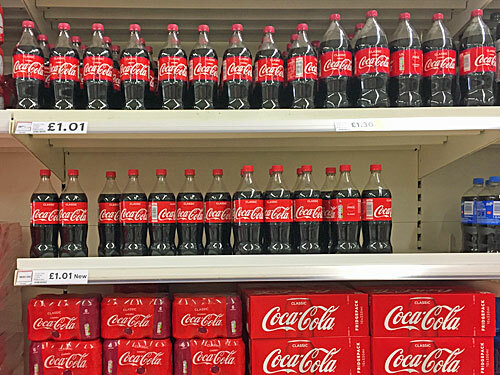 Coca Cola pulled a particularly crafty trick in advance of Sugar Tax Day by changing the size of their flagship bottle. This used to contain 1¾ litres but has now shrunk to 1½, which helps to disguise the true magnitude of the sugar tax increase. Cut the volume by 14% at the same time as slapping on a 24% tax, and the hope is that consumers won't get so cross about a 20p hike which would otherwise have been 36p. Customers should of course also be shopping around. The prices of fizzy drinks vary massively between supermarkets, and what you think of as normal in your local store may be extortionate compared to elsewhere. For example, here are the prices of six cans of Coke in five online supermarkets, after the sugar tax has been added. That's a 10% variation between Sainsbury's and Asda in the price of this six-pack staple. And remember, each of these cans contains 7 teaspoons of sugar, or 35g, which is the reason the sugar tax is so long overdue. Indeed, between them the six cans contain 210g of sugar, which is about as much as you'd normally put in an entire Victoria sponge. Meanwhile, here's what's just happened to a 2 litre bottle of unadulterated Pepsi. The sugar tax plus VAT should be 58p on a 2 litre bottle, but these are the actual price rises this week. Red Bull is another sugar-heavy beverage where the top rate of tax applies. Waitrose increased the price of eight 250ml cans this week from £7.99 to £8.57, an increase of 58p (48p sugar tax plus 10p VAT). But the sugar-free version still costs £7.99, which is yet another reason never to buy the sweeter version. If you insist, then you really should be buying your Red Bull at Asda, because eight cans only cost £6.79 there. And what of Lucozade? A 1 litre bottle of Lucozade Original currently costs £1.50 at Tesco, Sainsbury's and Waitrose, exactly the same as it did earlier in the week. It may be called 'Original' but the recipe is anything but, the sugar content having been cut by two-thirds last year to avoid the new tax. This particular reformulation hasn't been popular, with long-standing drinkers despising the taste, and diabetics angry the new formula can no longer halt a sugar dip. Assuming you still fancy a bottle you again want to be going to Asda, where the unoriginal Original only costs a quid. In conclusion, the imposition of the sugar tax is a financial minefield, but with the underlying message that sugar-heavy drinks now cost considerably more. If you are so brand-obsessed that you can't deal with the artificial sweetener version, you deserve all the tax and cavities coming your way. Maybe you should switch to tap water, assuming you haven't already, and save pounds. Just give fruit juice a miss, because that's also ridiculously sugar heavy, but the government hasn't got round to taxing it yet.